The Riviera Maya has been one of the top tourist destinations for more than a decade, thanks to its unbeatable array of unique features. Comprising an 80-mile stretch of coastline on the Yucatan Peninsula on Mexico's east coast -- beginning just south of Cancun and stretching south to Tulum -- it's easy to get to with a modern international airport in Cancun and another under construction in Tulum, an hour south. The area has great weather and gorgeous beaches the Caribbean basin is known for -- and all the advantages that stem from being on the mainland rather than the limited geography of an island. Among the most notable are endless Mayan ruins and world-class attractions, including entire lost cities and towering pyramids. 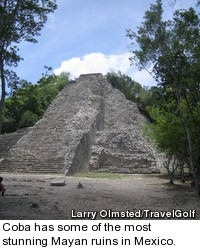 The most famous of these are Coba, Chichen Itza and Tulum, but there are many others. Water sports here are equally world-class, with more than 70 miles of nearly continuous beaches -- all protected by the world's second-largest barrier reef, famed for its drift diving and extremely popular with divers, snorkelers and anglers. The wet fun is not limited to offshore, either. The limestone peninsula is dotted with more than 100 notable cenotes -- large sinkholes filled with fresh water, many of which connect via underground caves, a truly one-of-a-kind dive attraction. These are some of the best swimming holes you can imagine. Moving inland, the terrain quickly turns to rugged jungle, but the adventurous offerings seem endless, from canopy zip line tours to off-road expeditions and six different major eco-culture theme parks. The region's main town, Playa del Carmen, is charming, filled with great restaurants and shops, and it has a wonderful pedestrianized main drag. The Riviera Maya truly offers something for everyone, from foodies to divers to beach bums to explorers -- and then there is the golf. The sport has boomed here in recent years, and there are two Jack Nicklaus signature courses (one 27 holes), another excellent one by P.B. 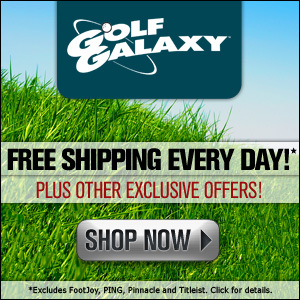 Dye, as well as designs by Arthur Hills, Robert Trent Jones, Jr. and many others. But while all these courses are public, and most anchor massive all-inclusive resorts on the Las Vegas scale, there is only one private residential community here, Mayakoba. It also has a golf course, a Greg Norman design that is home to the only PGA Tour event played South of the Border, the Mayakoba Classic. 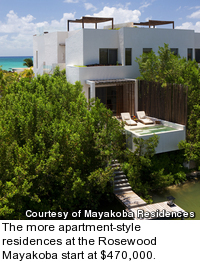 Mayakoba is easily the most luxurious offering of its kind on Mexico's east coast. And unlike many such projects, it's completely operable, with a full slate of facilities that have been open for years. Mayakoba is an ambitious undertaking, to say the least. Two decades ago, Spain's largest construction company (OHL) acquired a lot of raw land in the Yucatan Peninsula, including this unique 600-acre plot of thick mangrove forests and dense limestone along the gorgeous coast, considered too rugged to reasonably develop. Undaunted, OHL saw long-term potential and began an expensive and cumbersome construction project. 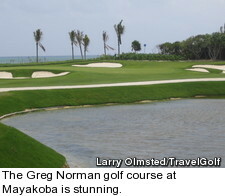 Eight years and $1 billion later, OHL had installed the infrastructure for Mayakoba, including the Norman course, which opened before any of the hotels or homes. Often called the "Venice of Mexico," the site is laced with deep canals carved from limestone, which link the hotels and are plied by a fleet of gorgeous mahogany shuttle boats. Each of the hotels (Rosewood, Fairmont and Banyan Tree) has a spa, gym, beach club and multiple restaurants, and all of these comprise a very luxurious private community loaded with amenities. There are still plans for two more resort hotels and possibly a second golf course across the street from the main gate, rumored to be a Nick Faldo design. For now, the Norman course is more than enough. Named El Cameleon (the Chameleon) for the way its appearance keeps changing drastically, it's considered one of the best courses in Mexico, a nation with high-quality golf course standards. The first and second holes feature unusual hazards in the middle of the fairways -- cenotes, or limestone sinkholes. The sprawling layout continues in two- to four-hole thematic sections, including jungle, mangrove forest, rocky canyon and coastal stretches, living up to its name. "This course is unique from others I have designed because of the variety of landscapes involved," Norman said. "The land it is built on includes three distinctively diverse zones: jungle, mangrove and beach dunes. It also has a canal system that winds through the course, a unique feature." 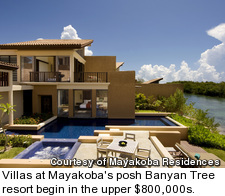 Currently, the residential offerings at Mayakoba are limited to completed one- to three-bedroom villas at the posh Banyan Tree resort, where full ownership prices begin in the upper $800,000s and contemporary residences in a more apartment-style at the Rosewood, which start at $470,000. While not exactly cheap, the dollar buys a considerably higher level of luxury and facilities here than in similarly positioned U.S. developments, where you would be unlikely to find anything less than seven figures. The villas at the Banyan Tree encompass expansive indoor and outdoor living spaces and many have private pools. The three-bedroom units span more than 6,000 square feet. 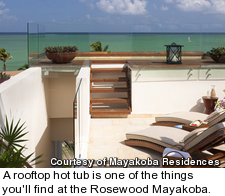 The Rosewood units also have large outdoor spaces, and the smallest begin at more than 1,000 square feet. They are also fully furnished, down to plasma TVs, and many have private gardens or rooftop terraces with outdoor showers. Almost all the units at either resort are on the water, either the beach or lagoon. Owners at either have access to all the facilities at the three resorts, all of which have earned the highest-possible AAA Five Diamond rating. It's no surprise that many of the buyers have been American golfers looking for an upscale winter escape.